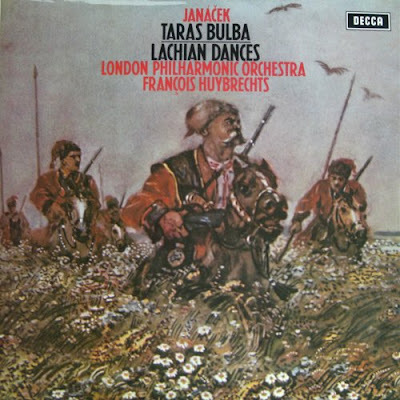 Back in 1972 I bought my first recording of music by Leoš Janáček, the gorgeous sounding and looking Decca LP conducted by the Belgian François Huybrechts seen above. Janáček died eighty years ago today on 12 August, 1928 and in commemoration Pierre Boulez conducts his music at the BBC Proms this Friday, 15 August. Janáček 's haunting solo piano work On An Overgrown Path (which is also translated as On The Overgrown Path) provided the inspiration for this blog which shortly celebrates a much more modest anniversary; the first post was uploaded on 24 August 2004, since when almost 1700 posts have hit cyberspace. It is a sign of our weird and wired world that if you type 'On Overgrown Path' into Google the first eight hits are for this blog and the ninth is for Janáček's divine composition. If, perchance, you are among the weird and wired who don't know Janáček's piano cycle please rectify the situation immediately with Leif Ove Andsnes' interpretation. Which takes us right to the heart of what this blog has been about for the last four years; Andsnes recorded On An Overgrown Path where music doesn't exist in a vacuum. What a relief to read your sensible suggestion of the Andsnes recording of the Janáček, rather than the Schiff (yawn). Thanks Gavin, the rub is the Andsnes recording has actually been deleted. But it is still available from some specialists.